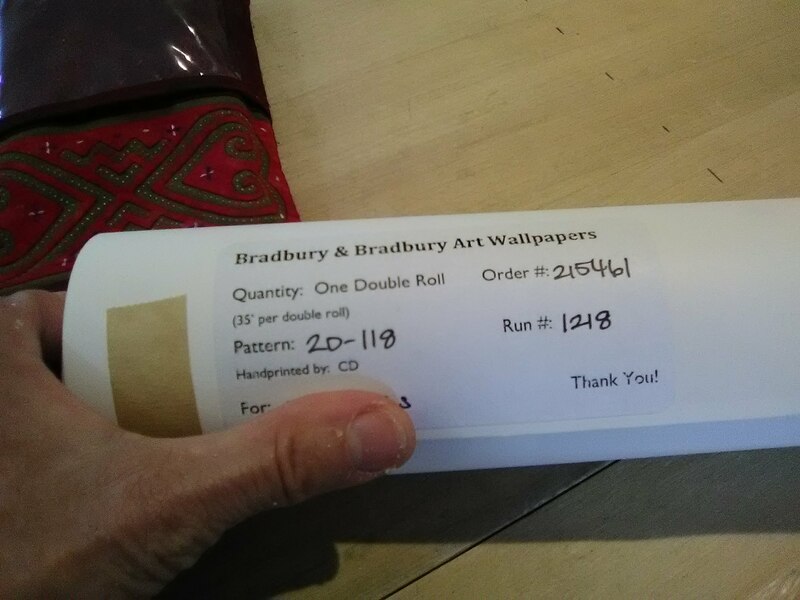 Bradbury & Bradbury is a well-established company based in California that produces wallpaper patterns in the style of by-gone eras – Victorian, Arts & Crafts, Art Deco, Oriental and more. I have their Raspberry Bramble, from the Victorian collection, in my own master bathroom. Do a Search here to see pics. Bradbury has unveiled some new genres recently, including the ’50’s Atomic Age and the ’20’s Vintage. These new products are digitally-printed, which is a little different from their other papers, most of which are screen-printed. Today I hung half of a master bedroom with their 2D-103. Those numbers are not very interesting, but the pattern is – see it in the photos above. 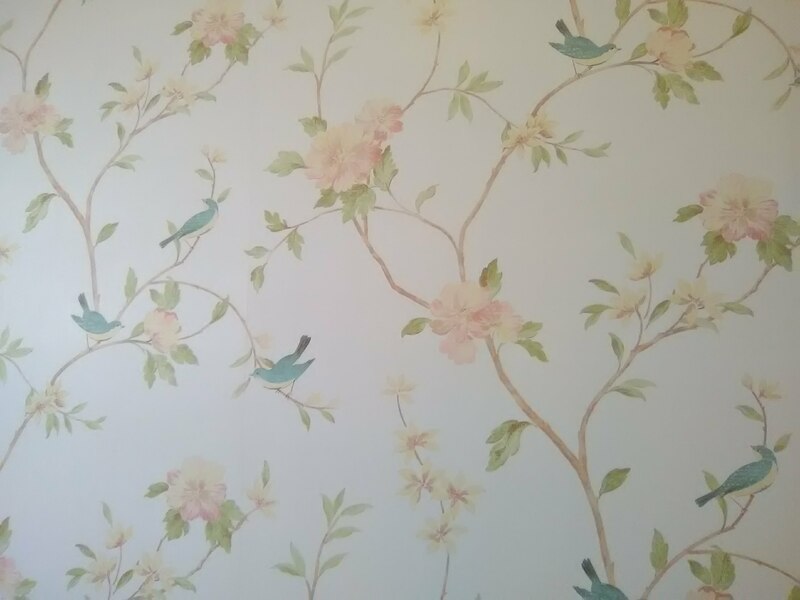 It’s a lovely, cheery, and easy-to-live-with birds, branches, and flowers, on a soft yellow background. 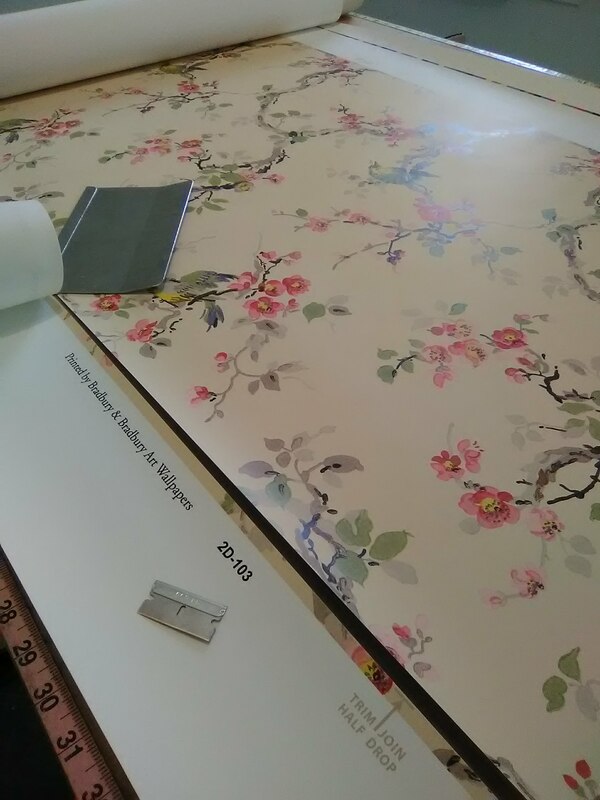 Bradbury wallpapers come with a selvedge edge that has to be trimmed off by hand, using a razor blade and straight edge (not shown). This takes precision and a lot of sharp new razor blades – I spent two hours trimming paper for these two walls (with more to come tomorrow for the remaining two walls). Once all that tedious trimming was over, the paper was a delight to work with. The seams melted together and were next to invisible. The paper hugged the wall nicely with no curling at the edges. Other companies with cantankerous papers could take a lesson from Bradbury. This home is in the Bellaire neighborhood of Houston, and was partially destroyed in the flooding after Hurricane Harvey in 2017. The homeowners love the vintage vibe of their older home, and when the house was rebuilt after the flood, they took great care to recreate the look of the original home … woodwork, flooring, kitchen cabinets, kitchen appliances… all are true to the home’s original look. This home in the Bellaire subdivision of Houston was flooded during Hurricane Harvey in August of 2017. Everything below the 4′ high water mark had to be cut out and thrown out. The homeowners loved the Mid-Century Modern vibe of their 1952 home, so, as the structure was put back together, they re-created everything as accurately as they could – baseboards, doors, cabinets, flooring – they even found a funky green refrigerator designed in the style of what I can only describe as an old Studebaker sedan. When it came to wallpaper, they wanted something to reflect the vintage vibe. After much research, they agreed on two papers from the Bradbury & Bradbury Vintage ’20’s collection. 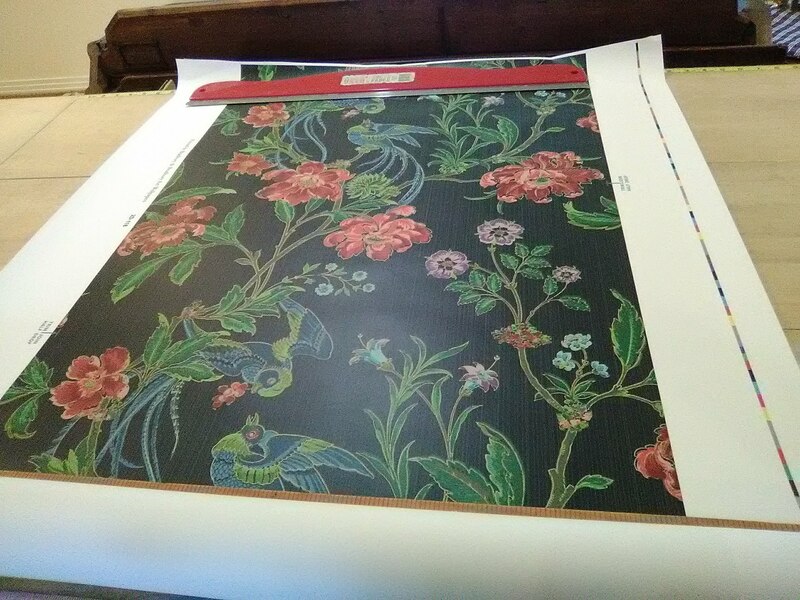 This colorful bird-flowers-and-foliage-on-black pattern went in their sun room, which can also be called the piano room. Like many higher-end or specialty and / or “boutique” wallpaper brands, this paper came with a selvedge edge that had to be trimmed off by hand (by me!). The manufacturer’s trim guidelines were spot-on, and so the edges were nice and straight, and the pattern design matched from strip to strip perfectly. This pattern is digitally-printed on a paper substrate with a somewhat shiny surface. 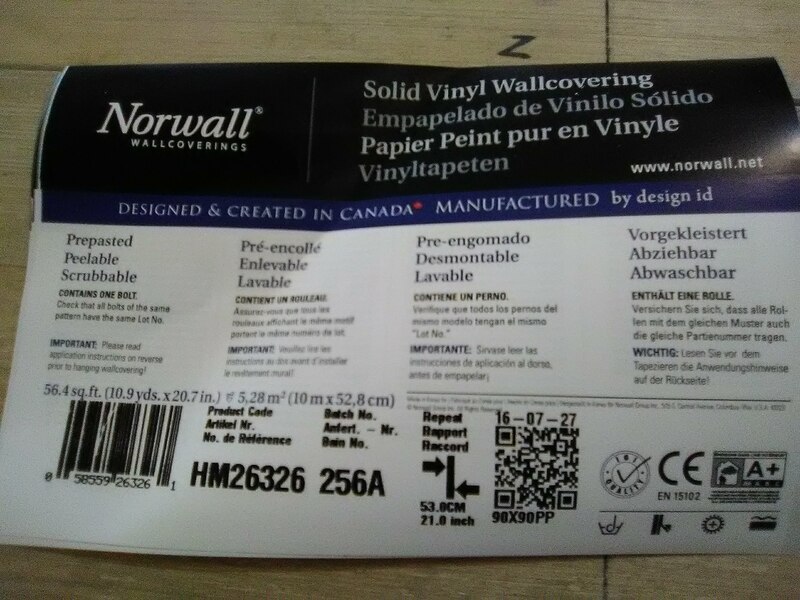 I found that it accepted the paste (clay paste is recommended, to mesh with the paper which is printed on a clay-coated substrate) with no protests, and, after appropriate booking time, the paper handled nicely and the seams laid down nice and flat. That slightly shiny surface also allowed me to wipe any stray spots of paste off the surface. Because the paper was black, I did take the extra step of using a piece of black chalk to color the edges of the strips, to keep the white substrate from peeking out at the seams. This room holds a grand piano, and is in the back of the house, where it looks out onto the patio and backyard. 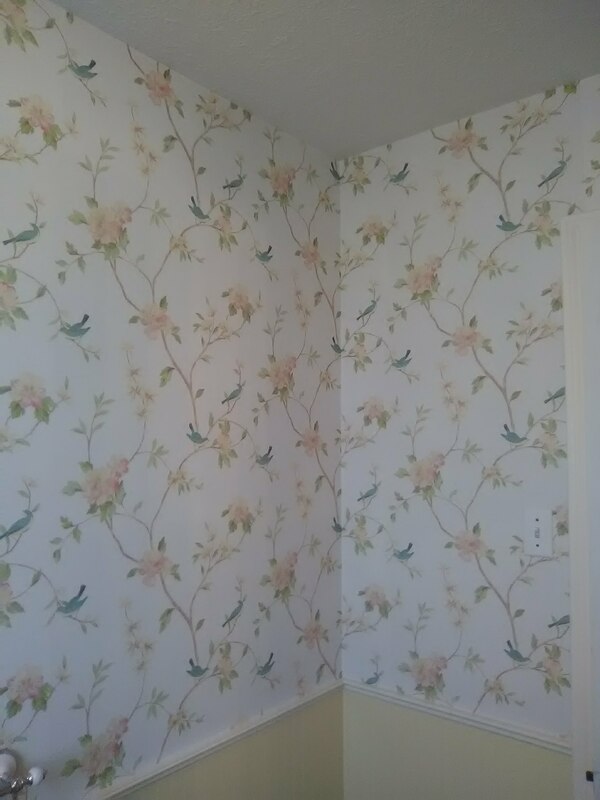 It gets a lot of sunlight in the daytime, and the colors in the wallpaper will really stand out, and will bring a lot of light into this very deserving home. 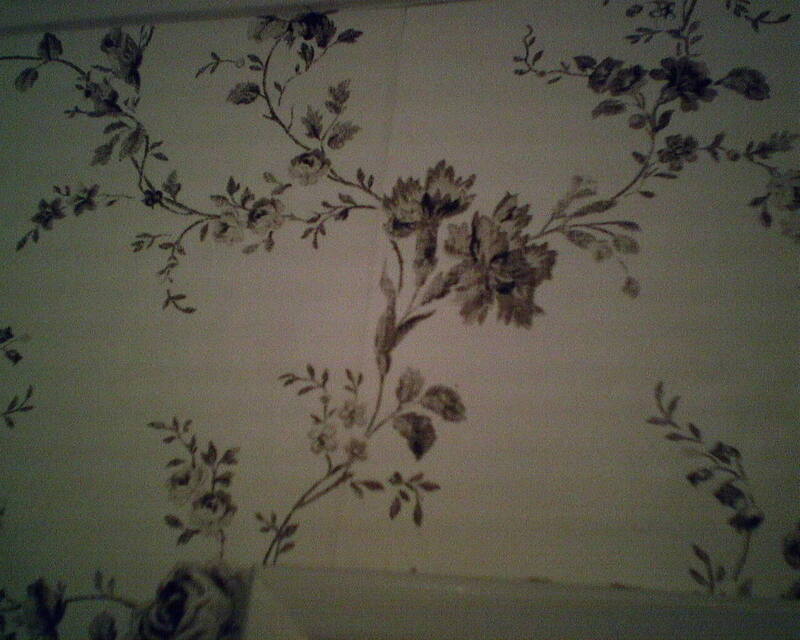 The original wallpaper had fallen victim to curled seams. 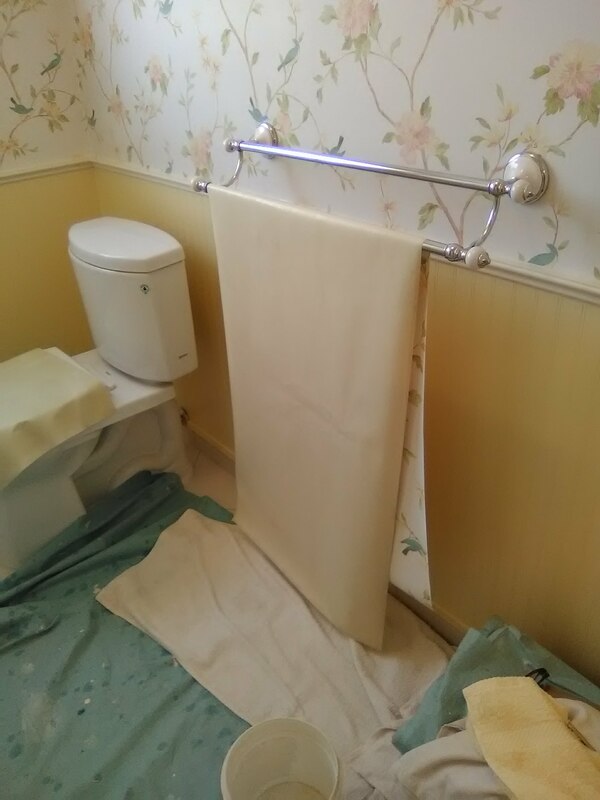 This happens most often with lower-end pre-pasted, paper-backed, solid vinyl wallcoverings, particularly in humid rooms, like this bathroom. Adding to the list of no-no’s were an improperly smoothed wall and the lack of a primer. The seams on these papers are never great to begin with. When there is humidity, it will find its way into the seams and onto the paper backing of the wallpaper. When this backing gets wet by humidity, it expands. When it expands, it has nowhere to go but out – pushing away from the wall. This results in a curled seam. 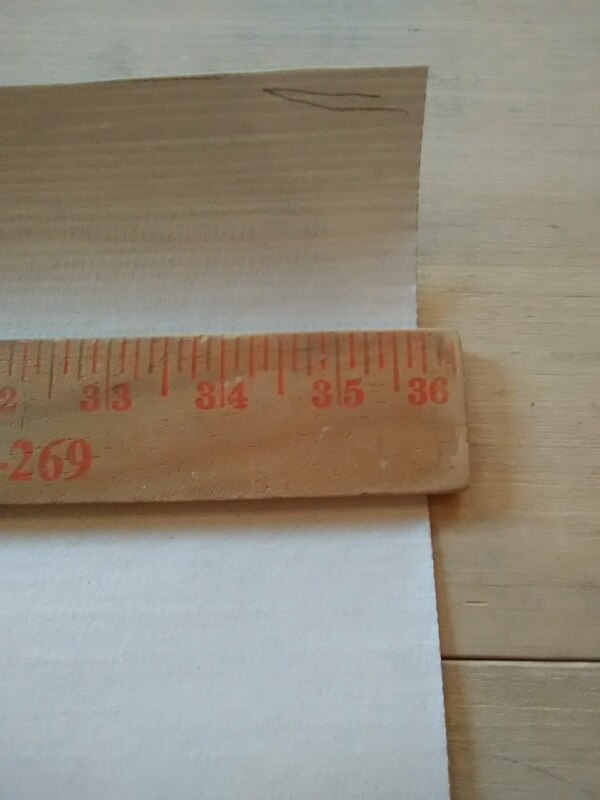 This is not “loose” wallpaper, and the seams cannot be glued back down. 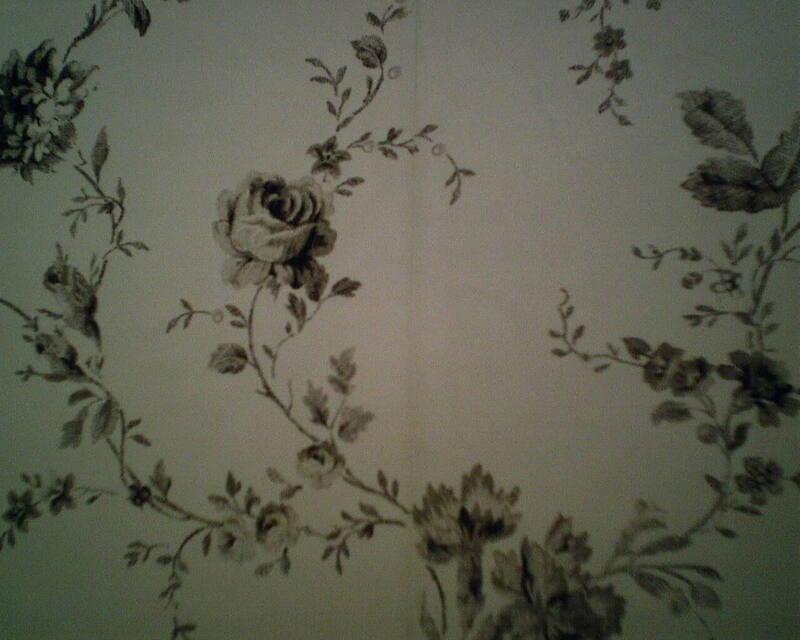 In many cases, the paper backing layer of the wallpaper actually delaminates (separates from) the top vinyl layer. 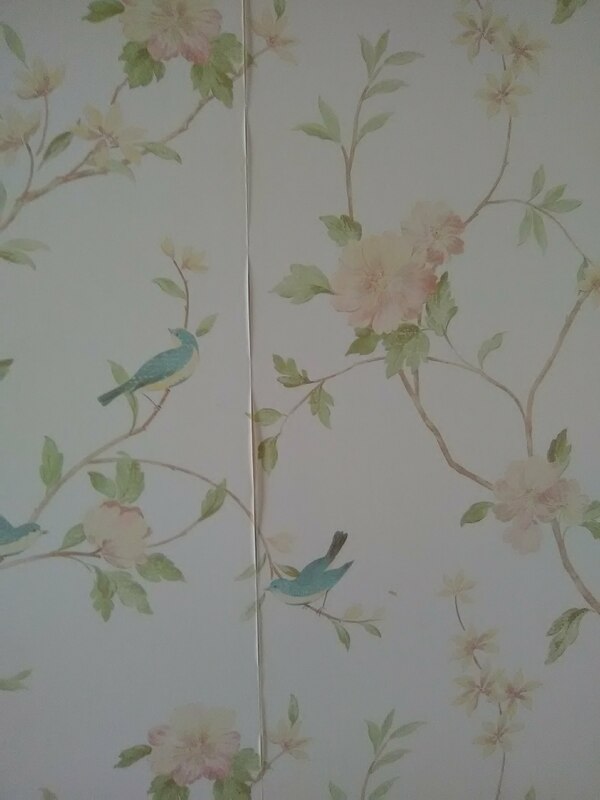 The homeowner loved the pattern, particularly the blue birds, and bought the same exact paper to replace the other. 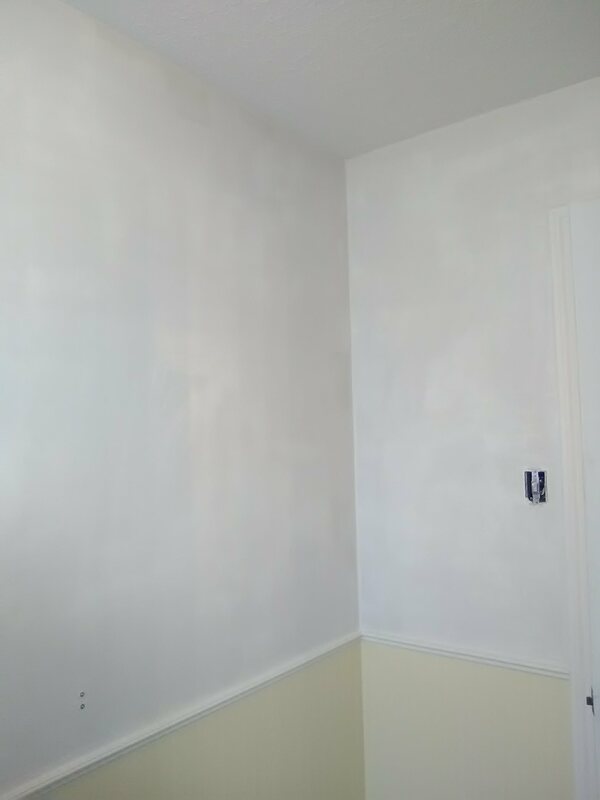 I stripped off the old paper, took various steps to stabilize the unsound wall surface, then skim-coated the wall to smooth it, primed, and hung the new paper. The look is cheery and bright, and looks fabulous with the pale yellow bead-board wainscoting. The seams looked good when I left, and will pull down tighter as the paper dries. 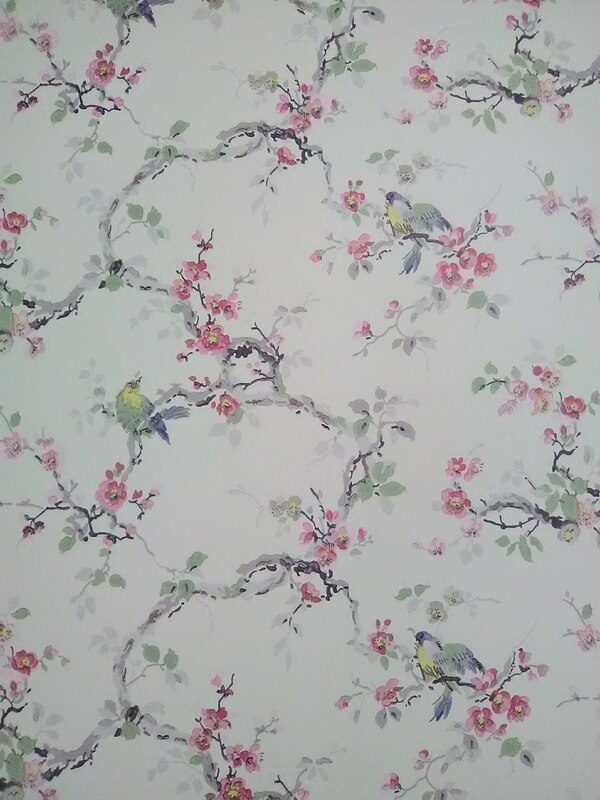 Still, these economical pre-pasted, paper-backed, solid vinyl wallpapers are not my choice for use in any room. And this particular brand (Norwall) just about tops my list for brands to NOT purchase. 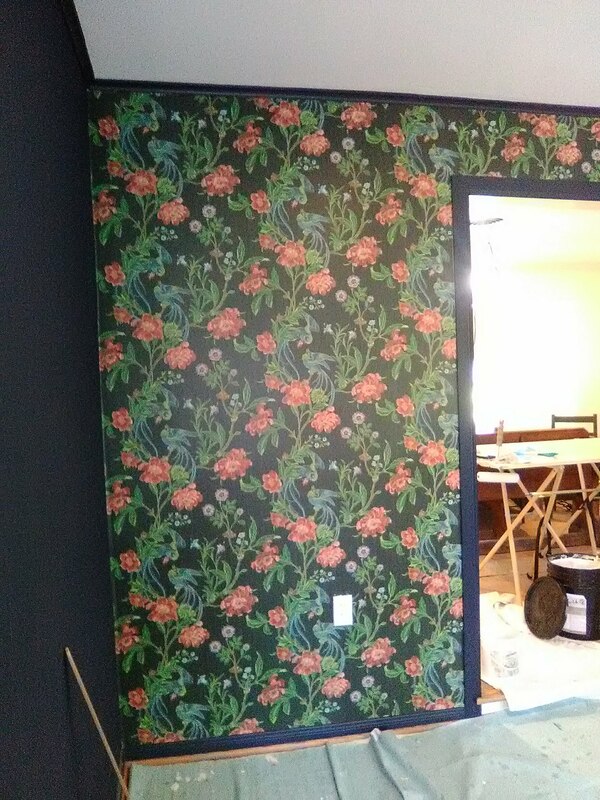 Here’s what I ended up doing with the Norwall pre-pasted, paper-backed, solid vinyl wallpaper that was featured in my previous post. This brand is known for curling seams, as well as seams that just don’t lie down nice and flat, but appear to be “pouched” just a tad. I experimented with several pasting techniques, hoping to get nice, flat seams. … It didn’t do well when I pasted it with full strength paste, as it got gummy and dried out too quickly. And it didn’t do well when I pasted it with diluted paste. Nor was it happy when I ran it through a water tray as per mfgr’s instructions (and then rolled a thin layer of paste onto the wall); it went up great and looked good … but look back at it after 10 minutes and discover that it has bubbled. What worked best was to wet it in the water tray and then unbook the strips and let them hang to dry out for 10-15 minutes or more. This left enough moisture for the paper to grab ahold of the paste I had rolled onto the wall, but eliminated the excess moisture that was causing the off-gassing and bubbles. I wet a bunch of strips at a time… I had them hanging over the shower rod, on the towel bars, over the door, and the small ones got set on the toilet to dry. When you measure a room that is to be covered with grasscloth, instead of figuring how many square feet need to be covered, it’s a better method to count the number of strips you will need. The standard width for grasscloth is 36″. For this bathroom, I counted up how many strips of 36″ wide material I would need to cover the walls. The only thing is, despite the manufacturer’s labeling, the material was actually 35 3/4″ wide. And the bigger problem is that two of my walls were exactly 72″ wide. 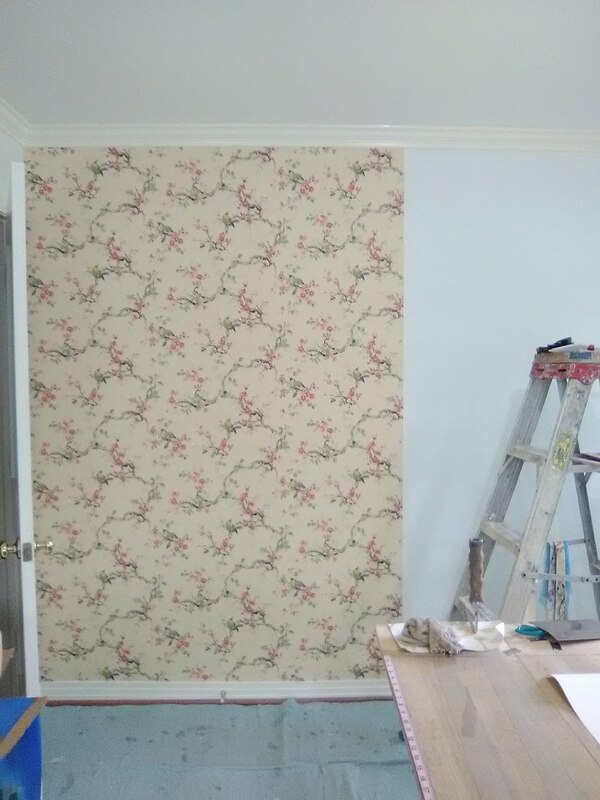 If the wallpaper had been the traditional 36″ wide, I would have needed only two strips and would have had only one seam on each wall. But that quarter-inch shortness in width meant that I would need three strips. I hated to cut that third strip of paper, because we were short on material, due to it having come in two different runs (read previous post). In the end, though, it all worked out, and the room looks great. It’s a good thing that I checked the run numbers. And that I also didn’t assume that everything was as it usually is. I’m glad I measured the width of the grasscloth before I started to plot out how I was going to hang the room, and definitely before I went and cut up any of the paper. You are not seeing two different runs on the wall… the color difference in the first shot is due to the first strip is drier than the second one. In the second photo, water has entered the paper through the edge, causing a darker color. In both cases, once the paper dries, it will be uniform color. In fact, the manufacturer was on the ball enough to mention this in the instruction sheet. That was important, because there is a phenomenon called “staining” or “blushing” caused by some pastes interacting with some wallpapers. It can look pretty much the same, but it won’t dry and disappear. Avoiding certain pastes can help prevent that. All the same, we paperhangers can be mighty nervous until the paper is good and dry. 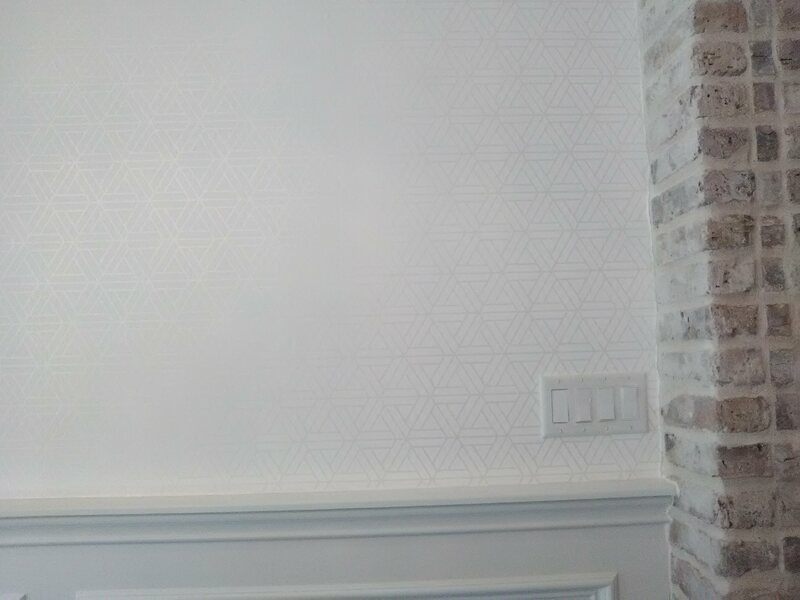 This is an economical pre-pasted, paper-backed, solid vinyl wallpaper. As you can see, it has not held up well. Humidity exasperates this situation, but it can happen in any room … the seams allow humidity to get into the paper backing, which swells with the moisture. This causes the paper backing to push away from the wall, which causes the vinyl top layer to curl back. Sometimes the two layers even delaminate (detach from each other). These are not “loose seams,” and cannot be glued back down. Do a search here to read more posts on this subject. 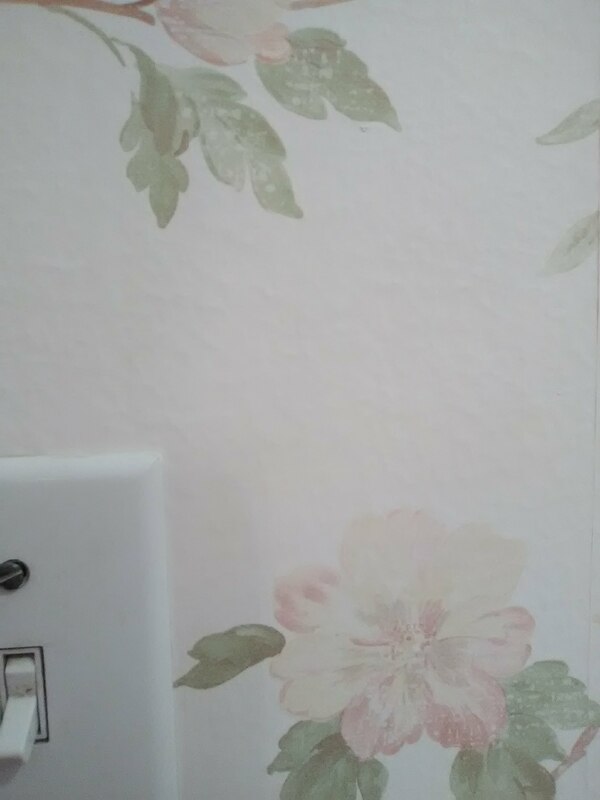 The texture on this wall is not heavy, but it can still be seen under the wallpaper. In the second photo, I am stripping off the wallpaper, and you can see the wall texture underneath. 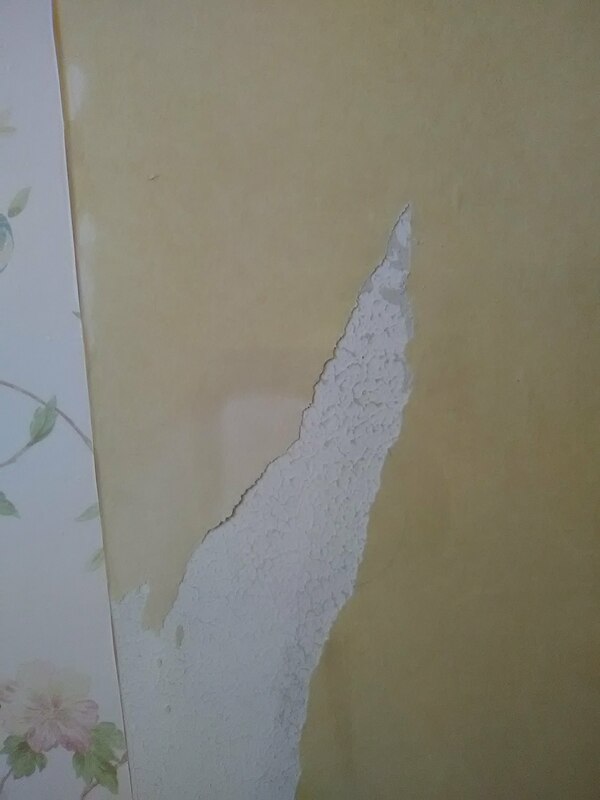 I removed the top vinyl layer of the wallpaper, then removed the paper backing. Then I skim-floated and sanded the wall to smooth it (no picture). 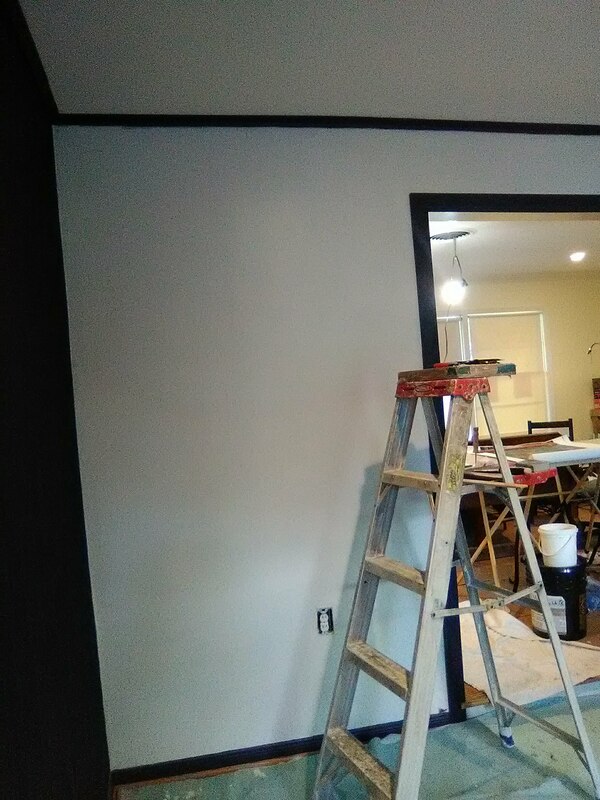 Follow up with a primer, and the wall was smooth as a baby’s bottom and ready for the new wallpaper. 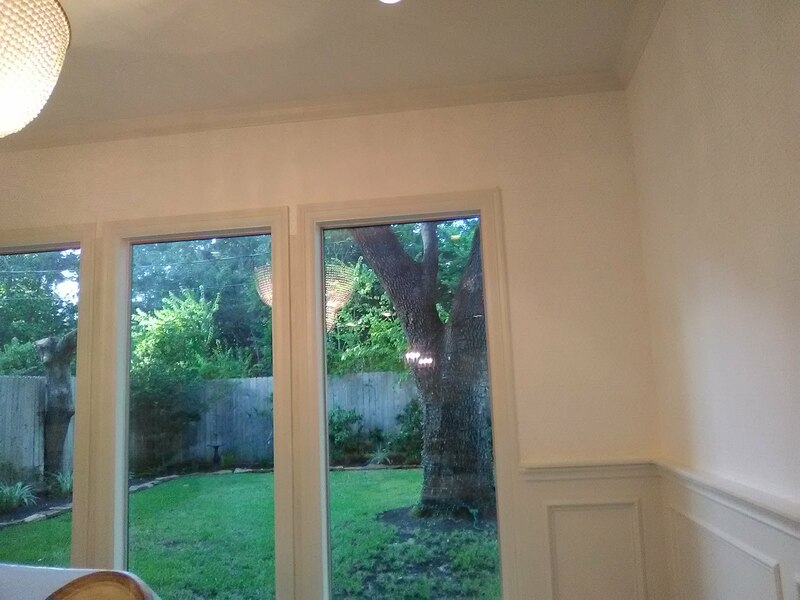 This dining room in the Oak Forest neighborhood of Houston was originally painted grey, and the walls pretty much blended in with the paneling and window moldings. Boring. The wife wanted something a little more dramatic – but the husband wasn’t going for it. So they found this wonderful compromise. The pattern is so subtle that it can’t be seen in the two distant shots. 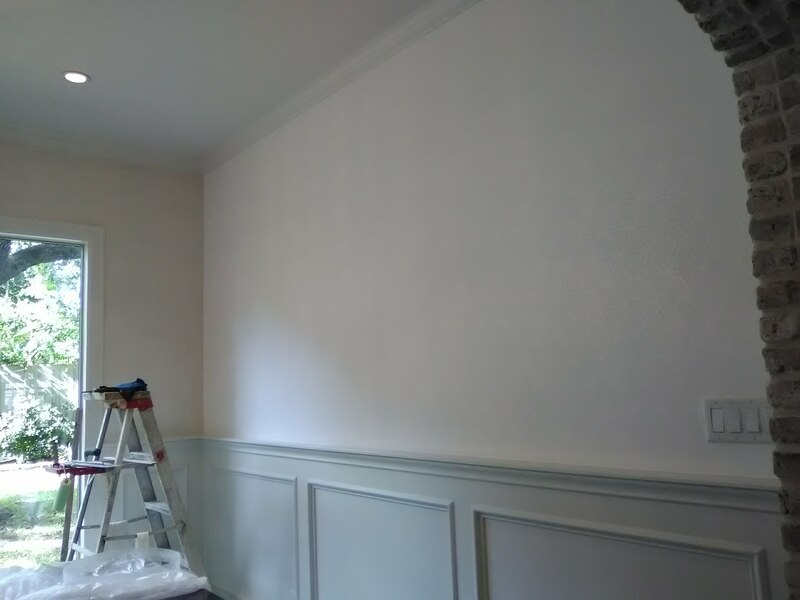 But you can see how the lighter color is brightening up the room, and how the contrast between the walls and trim show off the pretty moldings in the room. It’s a pearlized silver ink on a white ground in a triangular geometric pattern. This pattern is meant to be a background, rather than stand on its own. There will be some large artwork, or perhaps a showy mirror hung on the walls, which will become the main focus. Interestingly, this house is an exact clone of a home a few blocks away, where I hung wallpaper last year – yes, in the dining room! You are currently browsing the Wallpaperlady's Blog blog archives for June, 2018.